TICKETS GO ON SALE 20 JANUARY 2018! Kuala Lumpur, January 2018– Attention to all fans of badminton and Datuk Wira Lee Chong Wei as you guys are set to witness the 1st and the ONLY screening of the 133-minute Director’s Extended Version of the “LEE CHONG WEI” movie on 9 March 2018 at the Bukit Jalil National Stadium, Kuala Lumpur Sports City. 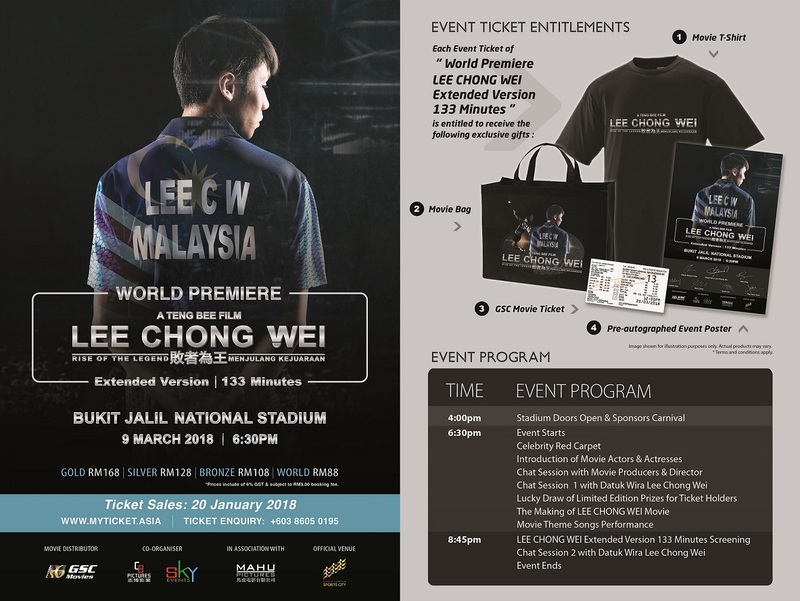 The Event, “World Premiere LEE CHONG WEI Extended Version 133 Minutes” will be attended by Datuk Wira Lee Chong Wei & family, Malaysian badminton legends, celebrities, the Director & cast of the LEE CHONG WEI movie. The badminton ace is getting the big screen treatment in a self-titled biopic. 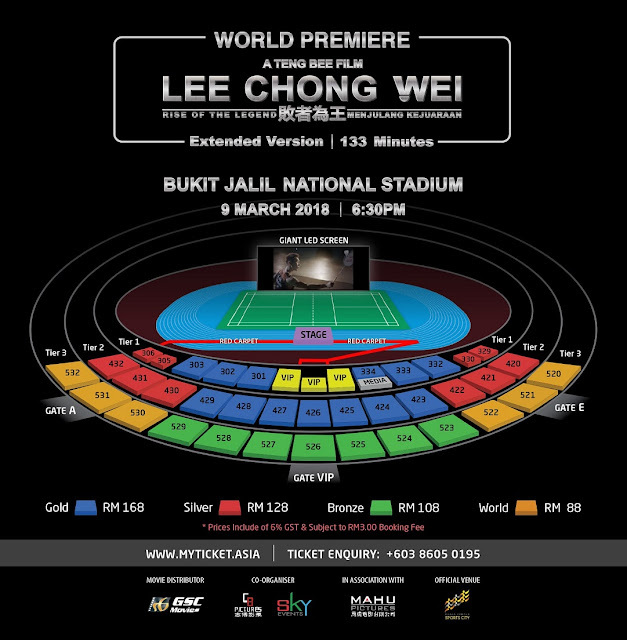 Directed by Teng Bee, the film portrays Lee’s life from the early stage all the way to him becoming the World No. 1 badminton player. 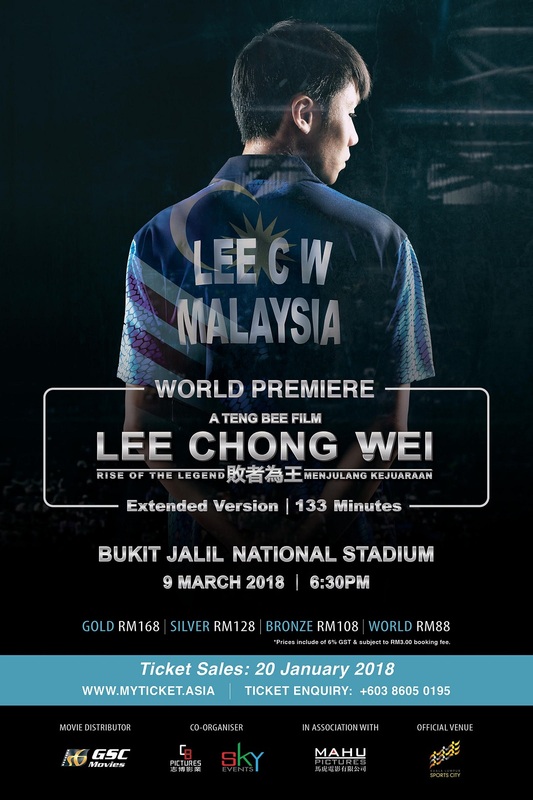 Co-organised by CB PICTURES and SKY EVENTS in association with MAHU PICTURES, the highlight of the Event is the screening of LEE CHONG WEI movie will be of the extended version in 133 minutes which will not be shown in cinemas. Largest Movie Screening In Malaysia! Tickets to the Event are priced at RM88, RM108, RM128 and RM168. Tickets can be purchased ONLINE via http://WWW.MYTICKET.ASIA from 20 January 2018 onwards. Ticketing enquiry can be made at +603-8605 0195. Each purchased ticket comes with one (1) LEE CHONG WEI Movie T-shirt valued at RM59, one (1) GSC Movie Ticket to watch the shorter version of LEE CHONG WEI movie, one (1) limited edition Movie Poster pre-autographed by Datuk Wira Lee Chong Wei and movie casts, and one (1) sponsored movie bag. These will be distributed at the National Stadium on Event day with proof of ticket.